The DG1000Z Series Waveform Generators adds to RIGOL's extensive portfolio of feature rich test and measurement equipment. Powered by Rigol's innovative SiFi technology, the DG1000Z is ideal for low frequency testing applications requiring high signal fidelity, low noise floor and long arbitrary waveform length. The 2 channel DG1000Z series features Best-In-Class memory depth of 2 MPts on the DG1022Z or 8 Mpts on the 30 and 60 MHz models, all with an available option for 16 Mpts. optional to facilitate deeper, more intricate arbitrary waveforms and includes up to 160 built-in waveforms for quick and easy access to more predefined signals. These generators provide +/-1ppm frequency stability and -125dBc/Hz phase noise for high signal fidelity and low noise, predictable signal generation. The DG1000Z series delivers up to 200 MSa/s sample rate and 14 bits vertical resolution allowing users to achieve fine resolution and signal detail while emulating small voltage changes on a large output range. Available in models up to 60 MHz [The DG1062Z (60MHz)], these generators offer a wide range of modulations including AM, FM, PM, ASK, FSK, PSK and PWM. The DG1000Z Series waveform generators combine up to 8 harmonics of the fundamental output frequency. Each harmonic may have an independently set phase and power level enabling almost unlimited options for a complete wave combination. 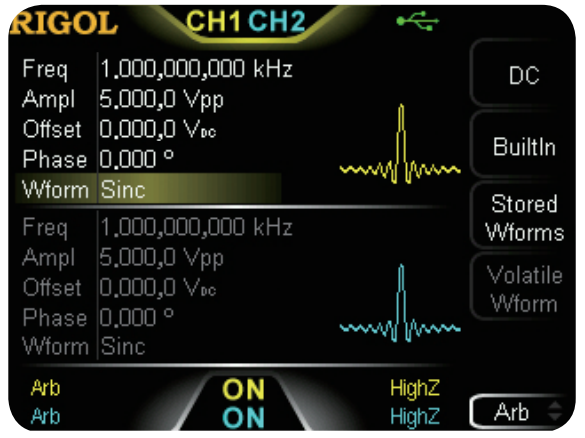 RIGOL's waveform generators are known for including many popular, customized wave types within the instrument limiting waveform creation to truly arbitrary applications. 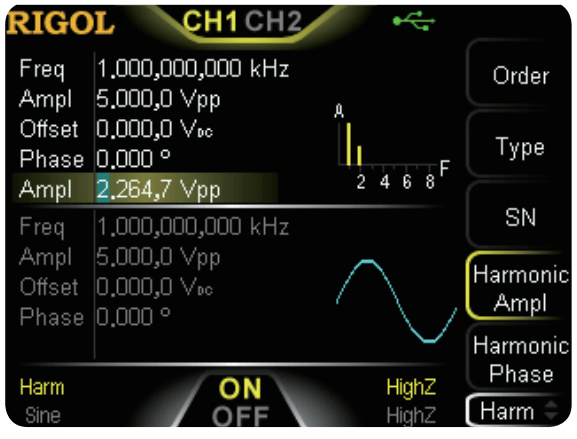 The DG1000Z continues this trend by including over 160 different signal shapes all accessible from the front panel selection menu. Better arbitrary wave playback with SiFi Technology Improved signal fidelity during arbitrary waveform generation creates low noise, predictable signals utlizing the SiFi technology that enables variable output sample rates. SiFi technology stands for Signal Fidelity. 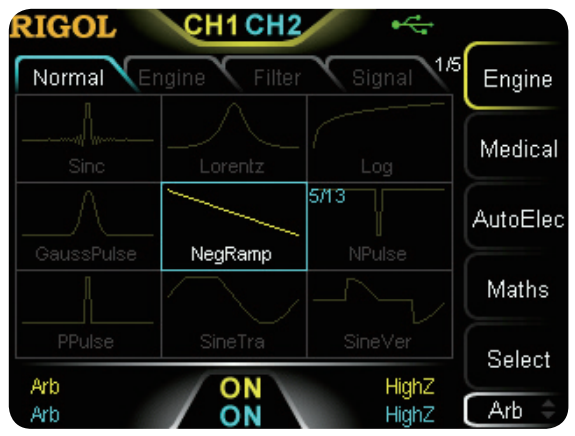 Play back your waveform with variable output sample rate selection so that you output values exactly when you need. No more duplicating or skipping arb points and no more complicated data manipulation to clean up your waveforms. SiFi technology combines high performance fidelity with deep memory in our DG1000Z generators. Download the SiFi Application Notefor more information.